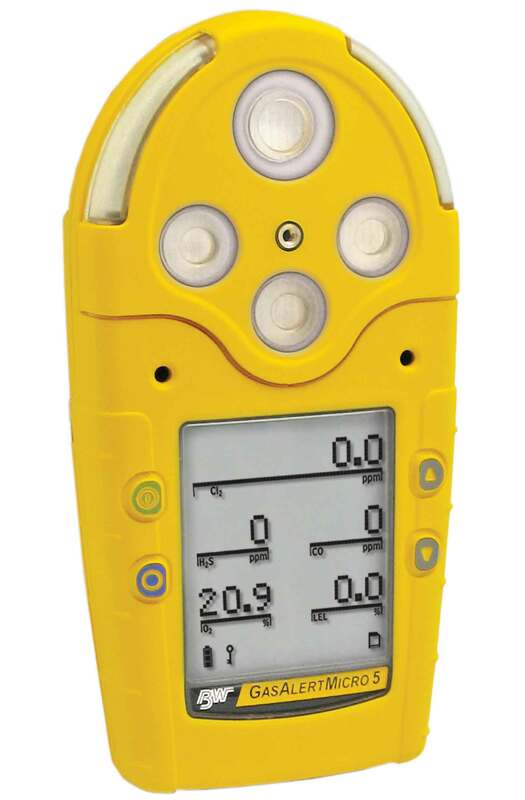 Smaller and 50% lighter than competitive instruments, this portable, multi-gas detector delivers a high-level of protection wherever it’s needed. GasAlertMicro 5 IR portable gas detector simultaneously monitors up to five atmospheric hazards including carbon dioxide (CO2), oxygen (O2), combustible gas (%LEL), and a wide selection of toxic gases. Compact and lightweight, GasAlertMicro 5 IR activates audible, visual and vibrating alarms in the event of a low, high, TWA or STEL alarm condition. Standard Versions: Complete with monitor and sensors (as specified), sensor compartment cover for diffusion operation, calibration adaptor and hose, quick reference guide and technical documentation CD, integral concussion-proof boot, and three AA alkaline batteries. Confined Space Kits: Includes standard version contents plus foam lined carrying case for instrument and accessories, 34 L cylinder(s) of calibration gas required for sensors installed, 0.5 LPM/1.0 LPM calibration regulator (male) and tubing. Heavy duty protection for extreme conditions. The concussion-proof boot slips easily and securely onto the detector for additional protection.